The unit is designed to be placed outside of the reservoir. The minimum water level above the transducer is about 1.5cm. This value will be dependent on the operation voltage. Higher voltage would allow for higher permissible water level. Too high or low water level will decrease the efficiency and heat will be generated. 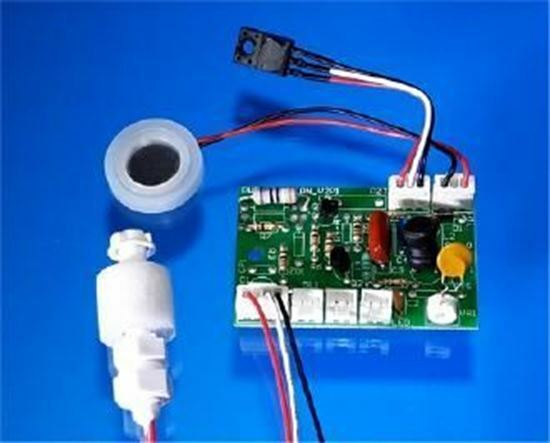 Accessories: Driver board, the Piezo transducer and water level sensor. Red Wire is Positive, Black wire is Negative. Applications: Nebulizer transducer, Aromatherapy mist generation transducer, Mist generation transducer for Hydroponic chamber, Humidifier transducer, Inhalation and disinfection equipments, Humidification in refrigerated food displays and storage, living environment and air conditioning plants, Hydroponics cultures, Humidification in industrial process, control for lubrication, coating, Facial beautification, ICP instrument and others. Notes: The kits are shipped with the mist output adjustment set to almost Zero to avoid burning the electronics when not properly connected. A heat sink should be attached to the transistor in order to dissipate heat and avoid damaging it. The maximum Amperage should be 0.8A or lower if the temperature of the transistor is too high. *Typical values in our laboratory testing results, these values will depend on drive circuit and fan speed. ==> A HEAT SINK MUST BE ATTACHED TO THE TRANSISTOR OTHERWISE IT WILL BURN.